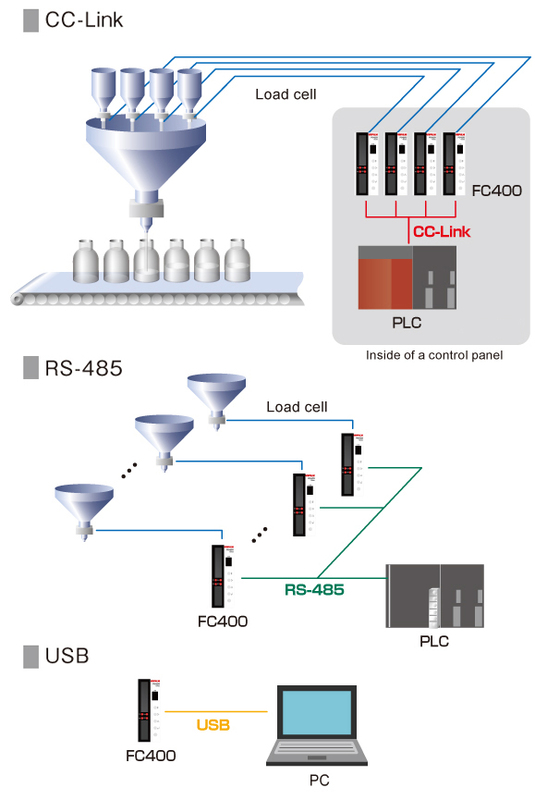 FC400-CCL is a weighing indicator equipped as standard with CC-Link interface. It is ideal for a variety of weighing applications like hopper scales, bagging machines, and level meters. Network with multiple units can be configured easily. Equipped with CC-link, RS-485, and USB interface! High-Speed A/D conversion and powerful digital processing capability of 1200 times/sec..
High display resolution of 1/100000 (max). Theoretical calibration can be performed easily by registering the capacity and rated output of load cells. Three additional points can be defined in the middle between zero and span for better linearity. Sequential control can be performed without connecting external PLC etc. or non contact (transistor, open collector, etc.). * DC24V external power supply is required.